Treadmill Fitness Walking is an effective way to burn extra calories and achieve a healthy lifestyle.Walking on the Exerpeutic 1020 is one of the easiest and most effective ways to achieve a regimen of regular exercise. Unlike outdoor walking, treadmill fitness walking has the benefits of shock absorption and the convenience of exercising in your own home, in front of a TV or just listening to your favorite music.The Exerpeutic 1020 has been tested up to 400 lbs user weight capacity allowing you to walk your way to fitness at any age and body size. EXTENDED WEIGHT CAPACITY: Tested up to 400lbs of user weight. MOTOR RATING: 1.5 Horse Power High Torque Motor. High Torque means that any resistance applied to the belt increases the motor’s power. The motor utilizes “Quiet Drive” which reduces any noise when walking so that there is no sound interference with TV’s or music. SPEED RANGE: Speed adjusts in increments of 1/10’s mph up to a maximum of 4mph. At 4mph the user can achieve a very rigorous fitness walking workout without needing to run. SAFETY FEATURES: Extra long safety handles are 18” long, more than 2 X the length of other typical treadmill handles, providing for walking securely preventing any loss of balance. PULSE MONITOR: Measure your target heart rate. EXTENDED WIDTH: The treadmill belt has been widened to a fitness club size of 20” for safety and security. HEAVY DUTY FRAME: The frame has been reinforced to accommodate a high weight capacity capability with wide side rails for a foot platform, if needed. MANUAL INCLINE: 2 position manual incline feature. CONVENIENCE: Speed control buttons and on/off buttons are on the handle bars for convenience. ASSEMBLY: The Exerpeutic 1020 is virtually assembled out of the box. Attach the computer and you are ready to go! COMPUTER: LCD display window features elapsed time, distance walked, calorie burn, speed and pulse monitoring. STORAGE: The Exerpeutic 1020 folds up easily utilizing a hydraulic shock absorber and then can be moved to different locations via transportation wheels. WARRANTY: 5 years motor warranty, 5 year frame, 90 days parts and labor. ToughTrain 3.5 out of 5 This is very simple treadmill, best suited for normal cardio workout and comes in a very affordable price. *Note: Most of the sites, stores or shopping portals listed above sell Exerpeutic 1020 Fitness Walking Electric Treadmill with discounts and other exciting offers. There is a possibility that the some of above websites are not selling Exerpeutic 1020 Fitness Walking Electric Treadmill now. Toughtrain.com is not liable for such cases or instances. 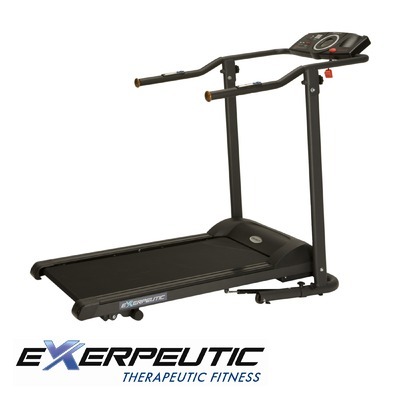 Also we do not recommend any seller for Exerpeutic 1020 Fitness Walking Electric Treadmill and a buyer should buy from where he/she gets best deal with quality of products, service and on time delivery (shipment).